Today’s vinyl flooring offers an elegant appearance and an enduring value. If you only remember yesterday’s vinyl flooring… you’re in for a pleasant surprise. 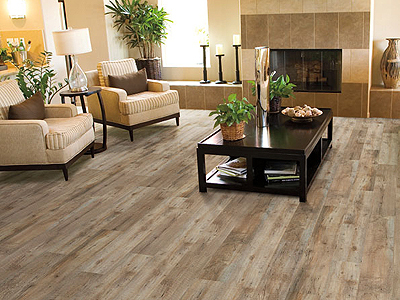 Nothing brings style, durability and comfort together quite like today’s vinyl flooring. And talk about affordability. That flooring in your kitchen may look like expensive hardwood. But it’s vinyl. Yes, vinyl flooring allows you to incorporate the look and feel of tile, hardwood or stone into your décor without the cost. You won’t believe it’s vinyl. Vinyl flooring has been around for generations. But today’s vinyl isn’t the faux flooring of yesteryear. Modern options are unique and trendy with finishes that closely resemble wood, tile and even stone. Cutting-edge technologies and digital designs make natural-looking textures and greater visual depth possible. Since vinyl flooring replicates hardwood or tile, you can use it in so many ways throughout your home. From high-moisture spaces like bathrooms, to cozy family rooms where you want the look of hardwood. Today’s vinyl flooring is available in sheets or as luxury vinyl tile. And whichever application works in your space, you’ll love the comfort it provides. Step across a vinyl floor in your stocking feet, and you’ll notice a more pliable feel to this surface that is relaxed and foot-friendly. For general vinyl floor care and cleaning, sweep your floor regularly (at least once a week) and be sure to wipe up spills promptly. Occasional mopping with the manufacturer’s recommended cleaning solution may be needed when dirt builds up and sweeping alone is not sufficient. Please note that soap or detergent products are not recommended for resilient floors as they will leave a dulling film on the surface. The Flex Floor products, however, can be cleaned with a damp mop and mild detergent or soap. Support furniture with wide-bearing, non-staining floor protectors. Ideally, the protectors should be at least 1″ in diameter, made of non-pigmented hard plastic, and rest flat on the floor. Non-staining felt protectors are also acceptable. Casters with a minimum 3/4″ flat surface width or greater are recommended for all moveable furniture. Make sure any floor protectors made of metal are rust proof. Replace your narrow dome furniture rests with wide-bearing ones.